China has executed a coal mine worker who killed an ethnic Mongolian herder and sparked Inner Mongolia's worst unrest in years. Li Lindong, a Han Chinese, was convicted of running over the herder as he tried to block his truck's path in a protest against noise and pollution. The death of the herder, named Mergen, caused protests across the region. Ethnic Mongolians say the majority Han Chinese are eroding their rights, especially with mining projects. The region has traditionally been home to nomadic Mongolian herders, but has seen an influx of mining companies keen to exploit the region's rich coal reserves. Their work has damaged grazing lands. Li was convicted of hitting Mergen with his truck and dragging him for more than 100 metres. 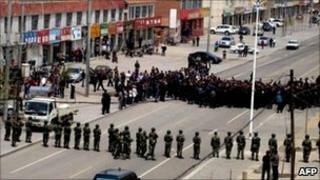 The herder's death on 10 May led to a series of protests in towns and cities across Inner Mongolia - which the security forces acted quickly to put down. Li's death sentence was handed down on 8 June and he was executed on 18 August, according to a one-sentence report from Xinhua news agency posted on a regional website. Less than 20% of Inner Mongolia's estimated 25 million residents are ethnic Mongolians.